Howdy folks! Your friendly neighborhood John Scrovak here, reporting in once again from locations unknown. Unfortunately, where I am, I was unable to bring my collection of hot sauces with me, so I don’t have a sauce to review. This is good news. Why, you ask? It gives yours truly an opportunity to get creative, to improvise, to go to McDonalds and buy some of those heavily-advertised Spicy Chicken McBites. Chicken breast chunks with rib meat, water, salt, food starch-modified, yeast extract, sodium phosphates, dried chicken broth, garlic powder, spice, onion powder, chicken fat, natural flavor (botanical source), soybean oil, maltodextrin, citric acid, vinegar. Battered and breaded with: bleached wheat flour, water, wheat flour, palm oil, food starch-modified, leavening (baking soda, sodium aluminum phosphate, monocalcium phosphate), tapioca maltodextrin, salt, extractives of paprika, spice extractives, maltodextrin, garlic powder, onion powder, artificial flavor, lactic acid. Source. Up close and in real life, they’re not much different than they appear in McDonalds’ advertisements and enhanced photos. Which looks like a cross between chicken nuggets and chicken turds. But it’s ok, because they’re totally not chicken nuggets, since McDonalds already has those. 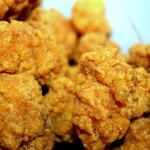 And they’re totally not popcorn chicken, since KFC has that. No, these are absolutely and completely unique and original. To be fair, I could only review about half the snack-size carton I received. This is because only about half the McBites in that particular carton actually contained chicken. The rest were just breading. Little, starchy, seasoned lies. But the pieces I received from the cute little Korean English -as-a-Second-Language girl at the drive-thru* were marginally acceptable by food standards. I say this because the primary ingredient in these chicken turds (because I refuse to continue calling them McBites) is actually chicken. That’s more than I can say for the Doritos Locos Tacos. As for the actual flavor, it’s exactly what you’d expect from McDonalds: the chicken is dry, the breading is drier, the exterior of the coating is greasy, and in the world of food, they’re downright terrible. In the world of fast food, they’re not the worst chicken containing parts. Also, they’re very much NOT spicy, contrary to their commercial claiming they have ‘just the right amount of spice’ because it’s ‘not all about the heat’. Well, if it’s not about the heat, good, because I’ve tasted spicier yogurt.